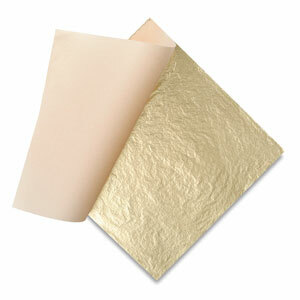 Imitation gold leaf, also known as Dutch Metal, used only for interior decorating. It will tarnish after a short period of service. Each leaf is 5½" × 5½" (140 mm). Standard book of 25 leaves. ™ Wehrung & Billmeier is a trademark.